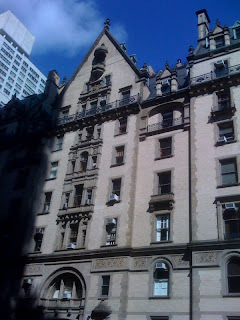 Before we visited the John Lennon memorial yesterday, we walked by the Dakota, which is the apartment building where John Lennon and Yoko Ono lived. It is also the place where his young 40-year-old life was abruptly taken away from him. 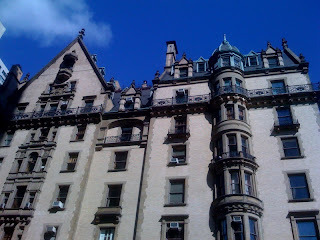 The Dakota, opened in1884, is one of New York City's most legendary apartment buildings. 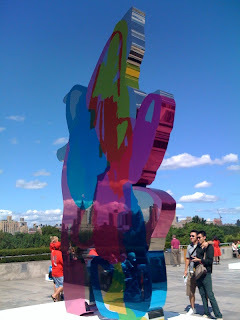 It’s located right at 72nd Street and Central Park West. It’s a very majestic, elegant, and intricate-looking building. 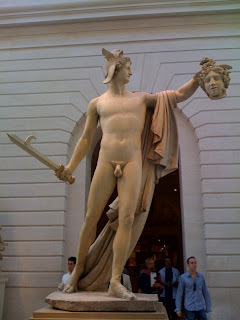 We weren't able to take good photos but here are some great ones. 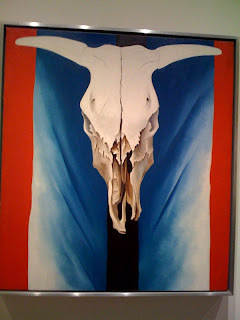 But the Dakota is eerily best known because of John's Lennon's assassination at its gates on December 8th, 1980. 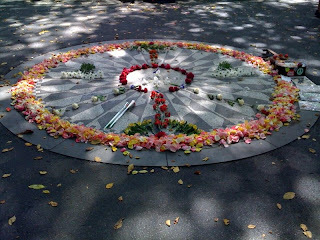 Central Park is located directly across the street and was supposedly a sanctuary for John and Yoko who frequented the park. 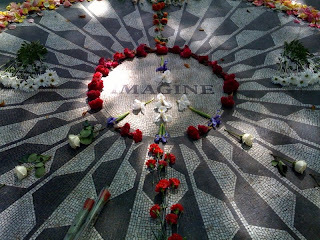 Strawberry Fields is a memorial built and dedicated to John Lennon, named after the song Strawberry Fields Forever. 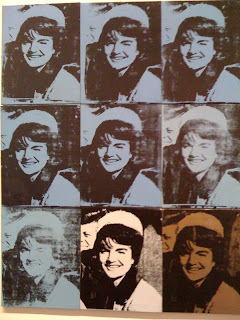 Yoko Ono gave New York $1 million to develop the memorial. No matter what people think of John and Yoko, there's were a love story, like many love stories - stories that we on the outside can't understand, sometimes that end tragically, but also produce inspiration. The memorial is a triangular piece of land with its main attraction being this mosaic of inlaid stones in the sidewalk with the word "imagine." There's always flowers and other gifts left by fans near the site, and here you can see the flowers were arranged to make a peace sign. 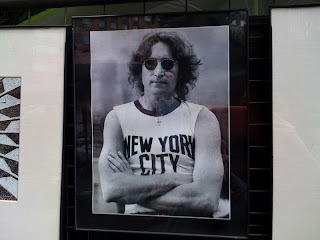 Fans gather here on Lennon’s Birthday or the day of his death each year. There were a lot of people taking photos of "Imagine" and just sitting on the park benches by the memorial. 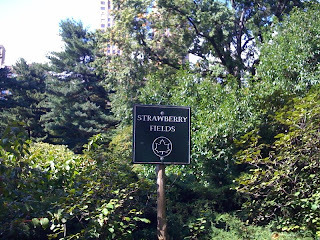 We were glad to have visited Strawberry Fields. It's a simple memorial but you really get a sense of how much the music of John Lennon and the Beatles meant to so many people, particularly that of our parent's generation on a level that we will never truly understand. To this day, I listen to In My Life, which was my high school graduation song, and remember exactly how I felt at the moment I was singing that song in my white cap and gown. Or how we listen to songs like If I fell and And I love her and we think of our beautiful moms back home and realize just how much we miss being able to hug them and eat the kind of satisfying meal that only a mom can make. Thank you John and the Beatles for your music. Finally our second Joseph sighting, again at the 8th ave stop. Joseph draws and colors space invader themed art - they're essentially variations on similar drawings glued to a card board backing (one with a dog about to be beamed up into space and the other is "UFO Activity" where the spaceships are attacking the subways, and that's the one we have on our wall). We would have bought "Beam Down Dog" except the one he colored today was pink. This time we were able to ask him some questions. Joseph's been an artist for 30 years but he's been selling his original art since 2002 and he said he's had no problem selling them from the start. He said he's usually at the 8th ave (at 14th St.) stop everyday, except Sundays (except today), from 6 to 9 pm, although we've never seen him at this stop during that time. Odd. He lives on 8th and somewhere in the 40s. What was cool about the UFO Activity he did today was one of the UFOs had blinking lights. But he only had two completed pieces left since some assholes stole his other artwork today. What kind of schmuck would steal from someone in a wheelchair that can't even chase after them? Losers. 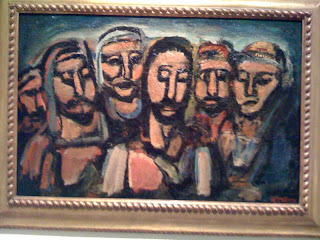 Joseph was still in positive spirits, his art is in demand that the low lives have to steal them. Oh well, not to worry we have plenty of wall space available for more Joseph originals. This is by far the nicest library we've ever step foot inside. 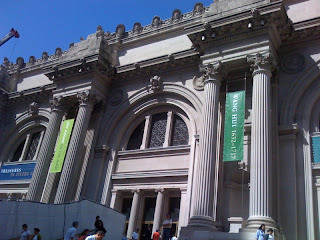 How often do you go to a library and see tourists taking photos? Never happened at our local libraries in our hometown. 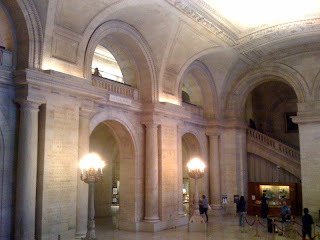 We walked into The New York Public Library on 42nd Street and it felt like walking into a museum. They even have a library shop that looks like it belongs at the MET. Holy Moses! 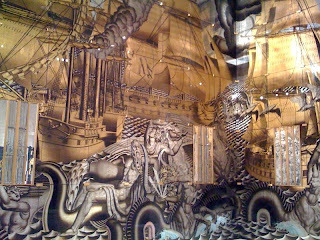 The classic details and artwork in this museum are just remarkable. Again, it's easy to forget you are at a library. Here's one of the two famous reclining stone lions at the entrance to the museum. The lions apparently went through several name changes, the most recent being "Patience" and "Fortitude." 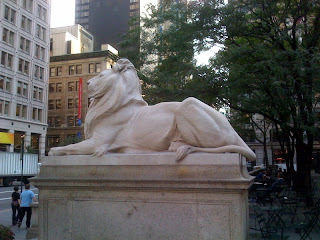 The lions were given those names because those were the qualities New Yorkers needed to endure the Great Depression, same qualities New Yorkers need now amidst this economic downturn. 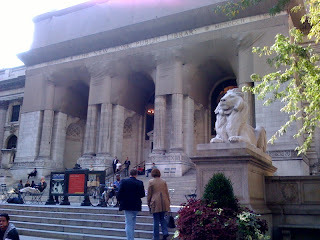 People also come to the museum to meet and just hang out on the steps between the lions. 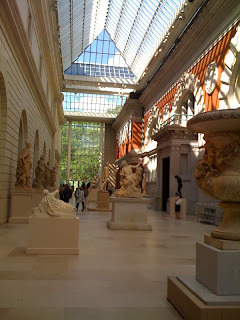 Just like at Bryant Park, which the museum is near, there's cafe style tables at the entrance for people to read (or people watch, which seems to be more the case). 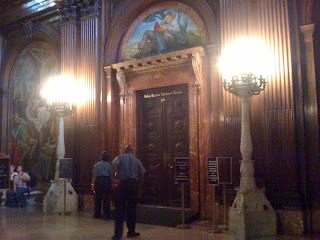 Also, this famous entrance was featured in the opening scene of Ghostbusters. The New York Public Library is one of the largest public libraries and research centers in the world. 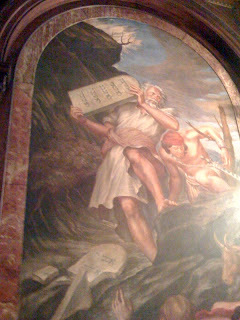 Throughout the year, The New York Public Library offers more than 25,000 free public programs, which includes lectures, exhibitions, classes, concerts, and film screenings. Yet another great thing about New York. 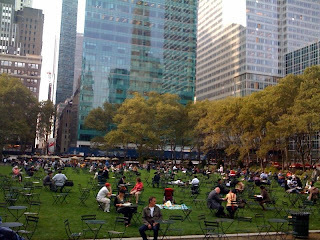 Considering how beautiful Bryant Park now is, I can't believe it used to be called "Needle Park" when the park was rampant with heroin dealers and cracked out users. Remember the 1971 movie Panic at Needle Park starring a young Al Pacino? 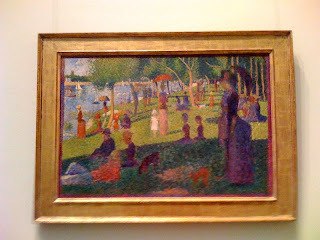 The movie was a pretty disturbing and gritty story about a group of heroin addicts who hang out in NYC's Needle Park. Bryant Park couldn't be any different now. Bryant Park felt almost like some parks in Paris, especially with the small cafe-style tables dispersed throughout the park. 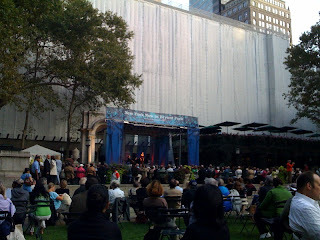 From now until October 8th, Bryant Park is celebrating classic music season to preview the upcoming seasons of New York City's best classical music organizations like the New York Philharmonic, New York City Opera, The Metropolitan Opera, and The New York Pops. 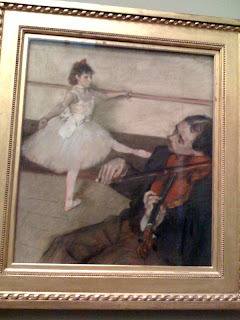 The concerts feature 90-minute performances and are free to the public. 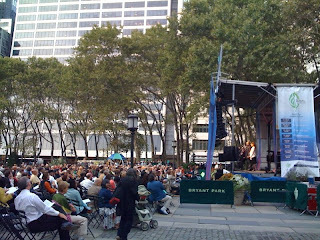 Yesterday, we had the pleasure of listening to the New York City Opera's performance of Love American Style. The performances were outstanding but we were completely unprepared (meaning, under dressed) for the biting chilly weather and couldn't stay for the entire performance. 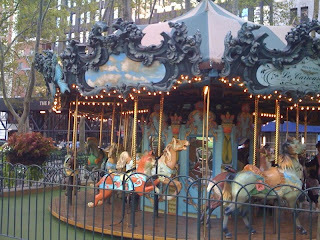 Sometimes we wish we had kids (or nephews and nieces, at least) so that we would "have to" ride with them on the Carousel. 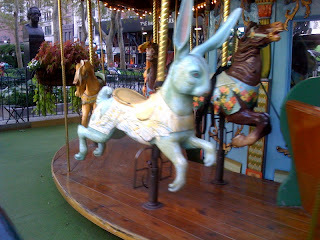 This Alice in Wonderland Blue Bunny is the one I wanted to ride. 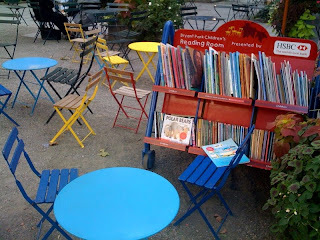 The park also has a little children's reading room area near the carousel. Bryant Park also has other things happening at the park, like yoga and tai chi classes and free knitting lessons (Marie, maybe I'll take one of these classes and knit you a sweater, which will consist of one arm being too long and the other being too short, and absolutely no buttons!). And we're looking forward to Bryant Park's Holiday Shops, a European style holiday market hosting over 120 shops, most of the shops selling handmade gifts from around the world, from November 22 to December 28. They also supposedly turn the park into a temporary ice skating rink during the holidays, and admission is free if you bring your own ice skates. During the summer, HBO, which is headquartered across the street from the park, has its free summer film festival at the park. Good Morning America also has free summer concert series. 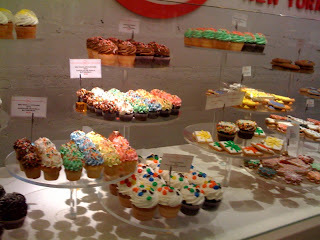 We are ecstatic about living so near the famous Chelsea Market, home to the Food Network and Oxygen Network. They have some wonderful specialty shops that foodies would adore, like Eleni's. Eleni's has cookies that look too good and artistic to eat and these phenomenal buttery cupcakes that come with an insane amount of frosting goodness. There's even mini cupcakes. 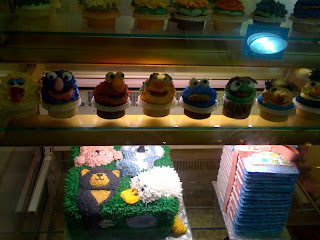 And look at these Sesame Street cupcakes we saw next door to Eleni's. Me want cupcake! (Click on picture to enlarge). Another great thing about Chelsea Market - we found Rihaku there! One thing to note about Chelsea Market is they do not like you to take photos of anything, inside or outside the stores. After I snapped the above photos, I was asked to stop. Then you look around and begin to notice how much security they have, we're guessing maybe because of the likes of Bobby, Rachael, Mario and Paula. 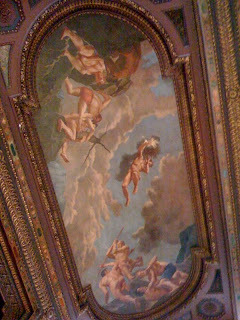 We'll be going there many more times and will be updating you with more great things we find there (perhaps without photos). 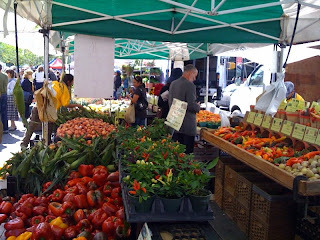 The Greenmarket Farmers Market in NYC is an open-air market that's been around since 1976, featuring fresh, healthy and local produce to New Yorkers. It supports local farmers by providing small family farmers a place to sell their fruits, vegetables, and other farm products. Basically, the rule here is that whatever is sold here by the vendor, they must have grown it or baked it. Although we've only been to their Union Square location, they have 26 locations in Manhattan, as well as in the outer boroughs, which makes it one of the largest of its kind in the U.S. And most locations are open in the dead of winter. 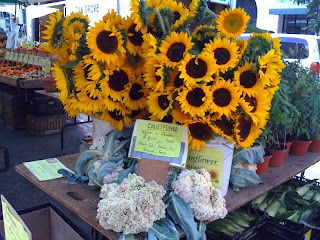 The Greenmarket also has "market-to-table" tours where New York's top chefs shop for their fresh ingredients with you at the market, then take you back to their restaurant where they cook for you using those ingredients. That sounds like fun! 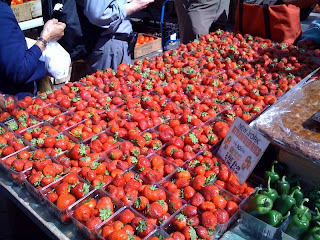 This strawberry farmer sold some of the freshest mouth-watering strawberries we've ever seen. 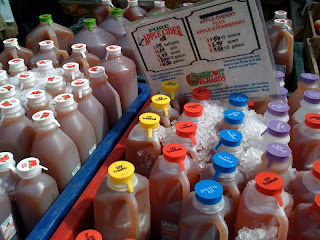 The same farmer also sold pure strawberry apple cider juices. 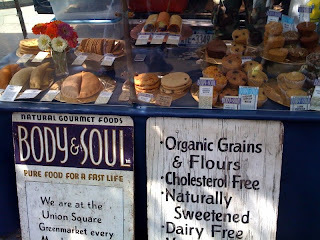 The market had a really nice and large selection of organic breads, cookies, jams, honey, and other treats. 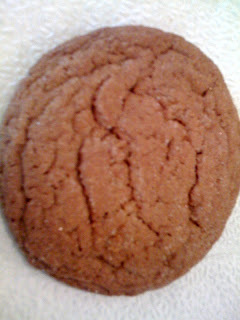 And we can't say enough about this gingerbread-like molasses/cinnamon/sprinkled sugar cookie that we fell in love with. One of the best cookies we have ever tasted in our adult life. It was crispy on the outer edges and chewy in the middle. Genius. Three large pieces, all for $2.50. There were so many absolutely stunning plants and a color burst of flowers here. We didn't see any that were wilting. 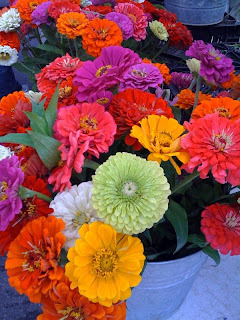 These flower purveyors bring the best of the best. And last but certainly not least, one of the main attractions for crowds at this market is this man - potato man, ladies man, sales man - Joe. He's a potato peeler and a fine pitchman with an eloquent British accent wearing a gentlemans' suit. Joe's been selling potato peelers at the market for over 15 years. 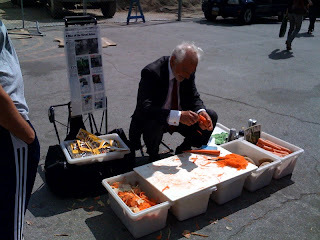 He demonstrates how easy it is to peel potatoes and carrots with the $5 Swiss-made peeler as though he's a carpenter. When he wasn't giving his crowd-pleasing demonstration, we saw him hunched over eating a sandwich that looked like it had nothing between the baguette except for the carrot he had just peeled. He has the best way of saying "po-tay-to." I was intrigued by this man so I wanted to do a little research on him and subsequently found some great articles, some from notable magazines, that covered his story. This man apparently lives in a luxury Park Avenue condo and dines out almost every night at the swankiest restaurants in this city. His potato-peeling pitch has made him a pretty well-to-do man. It's actually quite refreshing to hear success stories of unique people here that's made their money outside the finance, real estate or fashion markets as is normally the case. It seems unlikely that this gig would support him financially since the vegetable peelers are only $5, but apparently he sells a lot of them. Joe also doesn't have a permit to sell in the markets so he gets chased around by security all the time, which doesn't seem to daunt him one bit. Did it live up to its name? A little. Could it be called greatburger? No. We're always doing our subway transfers at the Union Square stop and we decided to eat at the goodburger at 870 Broadway, between 17th & 18th. They're a chain so they have three other locations in Midtown. 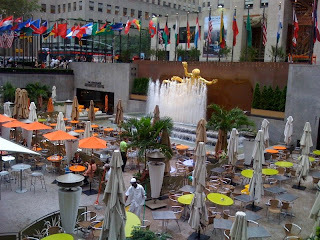 This Union Square location was hectic with the business lunch crowd. The good: The burgers are cooked the way you want it. 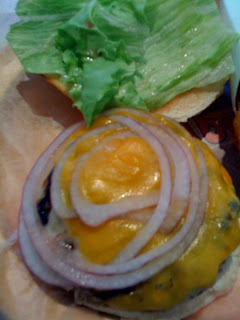 I ordered my cheeseburger ($6.75) medium well and it was cooked perfectly to my liking. They also give you the option of getting your burger with the works (lettuce, tomato, onions, pickles, ketchup, mustard, and mayo) or selecting what you want in there. I opted for just lettuce and onions. It beats having to peel the things you don't want off your burger. And yes, that's lettuce on my burger that I chose to have - I don't know what's becoming of me. The average: The onion rings ($3.25) were just OK. Nothing special. 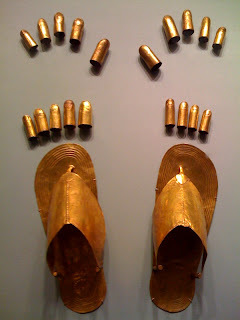 Some of them were falling apart. Granted, we had no problem finishing them all up. 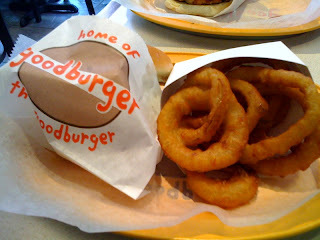 Pop Burger's onion rings were better. 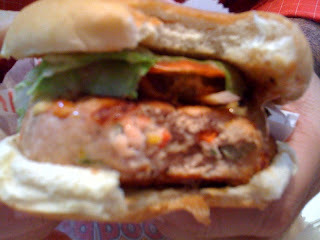 The bad: The turkey burger ($6.95) was dry. It was also a bit unusual and unexpected, and not in the happy surprise kind of way - it came with onions and peppers stuffed inside the meat of the burger, as opposed to on top of the meat. 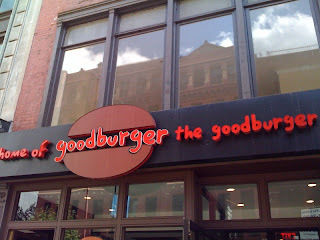 goodburger's company mantra is that they are all about freshness. Their burgers are made from fresh 100% pure Hereford beef, free of additives, fillers and preservatives of any kind. They also state that their butchers carefully hand-cut and grind the beef in their own facility, maintaining total control over the production of every burger. The burgers are grilled fresh to order. Their vegetables are delivered fresh to their stores every morning. There are no microwaves at their restaurant. They make their fries from 100% pure, cholesterol-free, zero trans-fat vegetable oil. Maybe all this "freshness" has something to do with some of their steep prices. And they say they make their milkshakes with "real ice cream from Vermont." What does ice cream from Vermont taste like? What the hell does ice cream from Rhode Island or Wisconsin taste like? We hear their milkshakes are one of the best in town, but we wanted to budget for lunch so we didn't want to fork over the $5.50 to $7.00 for one milkshake. This place was average. We're not sure if we would make a second visit for an overpriced meal that should be affordable. The Golden Arch across the street might be the better choice the next time we're hungry in Union Square. Last week we were almost melting in our apartment from the heat. Today, we stepped out of our home into chilly air. We noticed half the people were bundled up in their scarves and jackets and realized how badly we need our box of sweaters that were supposed to have arrived in New York by now but are still on a boat in the ocean somewhere. 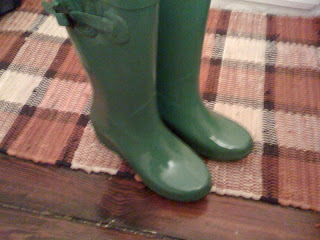 Luckily, I have my cheap-o fun green rain boots for puddle jumping. Nothing is too strange in New York City. You stumble upon the most amusing things as you walk down the street that most veteran New Yorkers don't even seem to notice. We're not sure what they were filming, but this "I love the 80s" contraption was being pulled down St. Mark's street and nearly took my foot out. Maybe a remake of Olivia's "Let's get physical"? 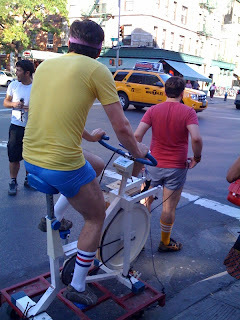 Or an advertisement for the really lazy man's exercise machine (where the hired help in red does the work for you). We realized we were far from our hometown when we saw this sign in a grocery store in the East Village. 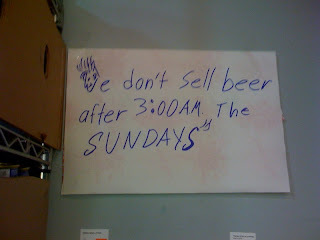 We verified with the manager that they sell beer at all hours of the day, except after 3:00 AM on "the" Sundays. This painting in the window of a Chinese furniture store made us smile ear-to-ear, and we would have bought it if not for it's steep $385 price tag. I mean seriously, can you imagine how great it would be to wake up every morning to Chinese naked man babies swimming in the skies, and that look like they were made out of the same shiny plastic material as that of Barbie doll? 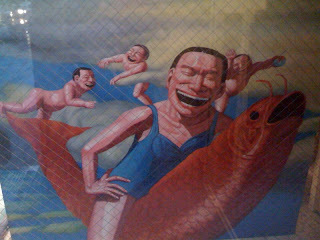 Come on, Chinese man wearing a blue granny one-piece swimsuit riding a fish . . . heavenly. Here we go again with our "neutralizing free radicals" rationalization. Hence, broccoli cancels out the artery clogging oils. Somewhere, our doctors are shaking their heads. The bottom line is that we love pizza. If we could eat pizza everyday, we would. But we wanted to do it guilt-free, so we had it with broccoli and garlic rather than sausage and pepperoni. 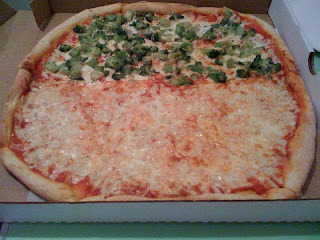 Last night we ordered a small one topping (half broccoli and half fresh garlic) pizza pie from Mezza Luna at 98 8th ave., our local pizzeria. The total cost for the pie and garlic knots delivered to our door including tip was $21 (not bad considering this pie lasted two days for two people). Below is a slice of love. Did we mention the slices are huge? 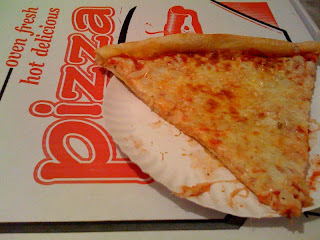 One slice is the equivalent of two regular slices from one of those famous chains. And normally a broccoli pizza sounds scary (especially from people like me that normally squirm at the sight of vegetables), but the broccoli pizza is good. You can barely taste the moist broccoli. It comes on a nice thin crust. But it's very oily - you have to dab the pizza with handfuls of napkins. They also have exceptional garlic knots (as long as you get it fresh) - $1.25 for five pieces. Mezza Luna looks like nothing special. Just the typical, small neighborhood restaurant. You won't see tourists lined up here like at Lombardi's. And that's a good thing. Skip their so-so pastas and head straight to the pizza. If you don't go right at lunch time, you might want to order a whole pie to avoid pizza that could have been just sitting there for hours. What is our luck that we moved to New York City at the worst economic time in recent history. It can't ever be easy, can it? Global stock markets continued to take a nose dive today with the collapse of U.S. investment bank Lehman Brothers. Its estimated that about 25,000 of the firm's remaining employees are being let go. News crews photographed (former) Lehman employees leaving the once prominent New York City headquarters office, carrying out their cardboard boxes as people watched. This with news that Merrill Lynch & Co. sold itself to Bank of America and that AIG suffered billions of dollars in losses due to deterioration in the mortgage and credit markets. Both presidential candidates were talking about the current economic state. Barack Obama said eight years of Bush "brought us the most serious financial crisis since the Great Depression." Obviously Wall Street bankers can say bye-bye to those former fat Christmas bonuses they've become accustomed to. Some of these bankers even start purchasing an excess of goods on plastic in anticipation of these bonuses. Unlike in other industries, where a yearly bonus is a tiny pat on the back, on Wall Street it's an important part of a worker’s salary package; often their bonuses can even exceed their annual salary. Wall Street bonuses are also seen as an important source of revenue for NYC when the bankers stop trading and start spending. Some of these bonuses are beyond imaginable for the average working-class Americans like us. For example, a few years ago Goldman Sachs CEO received the largest Wall Street bonus of $53.4 million. Yes, that's millions. Read this interesting 2006 article on these astronomically insane bonuses. Just two months ago when we looked at the jobs and salaries postings on Craigslist, it was much greater than it is now. What a difference just a few months makes. So the economic atmosphere here (as the rest of the country) is bleak right now but we're going to try to remain positive and make the best of our experience here. Plain and simple, we have to. This financial meltdown is tough, but so are thick-skinned New Yorkers. We'll learn to be resilient like them. 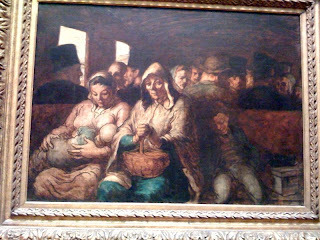 But the ones to feel sympathetic towards during these times aren't the bankers that won't get to travel to Europe this year or dine at five-star restaurants every night, it's the mom and pop stores that are suffering - like my aunts who just this week had to make the hard decision to close their small shop due to the decline in tourists and tourist spending. We wish the best for everyone. 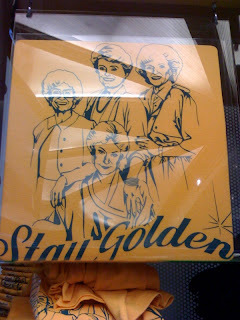 We saw this great Golden Girls T-shirt at the NBC store, where they sell merchandise of some of NBC's past and present popular TV shows. And then it happened. "Thank you for being a friend, traveled down the road and back again, your heart is true, you're a pal and a confidant . . ." All week, from morning until night, this opening song to the Golden Girls has been stuck in our heads. Then you start thinking about the show and remember the characters - the masculinely voiced Dorothy, the child-like naive Rose, Southern man-hungry bed-hopping Blanche, and our favorite the Sicilian one-liner, sarcastic, brutally blunt, balls and tongue of Steel Sophia. Seriously, it's been ages since we last saw this show and yet we remembered all the words to this sitcom's opening song. But we wanted to actually hear the music and we found it on You Tube. The TV theme songs of the 80s and early 90s were memorable, and to this day you can still happily sing along to them. Thanks to You Tube, you can find all the classic theme songs: Cheers, Taxi, Growing Pains, Dynasty, Love Boat. (Side note: Did you know there was this line in the Cheers theme song: "And your husband wants to be a girl, be glad there's one place where everybody knows your name." Well, I'll be darned, missed that one.) You can even find your childhood cartoon favorites like Fraggle Rock. I'm telling you it's addicting. Once you start hearing some of the opening songs, you're hooked. Try it. Sorry if I just got a song stuck in your head. The nostalgia tied to certain shows - Remembering the dance lessons I took after having Fame as my babysitter many night when my parents were pulling double shift at work late at night. Family Ties has probably one of the greatest TV theme songs (and it was a great show). It's a bit sappy but don't tell me the "What would you do baby, without us . . . sha la la la" doesn't tug at you one bit. 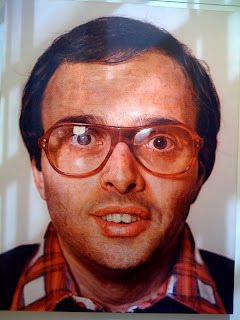 And who doesn't remember the young Reaganomics Republican Wall-Street wannabe Alex P. Keaton played by Michael J. Fox, whose character was a great contrast to his hippie parents. When we were growing up, there were a lot of these family-centered shows like Family Ties and Wonder Years that had strong memorable characters and great dialogue. Where have these creative writers vanished to? And why did Seinfeld have to end? Now there's most crappy reality shows. Before we moved to New York, when we were trying to save money on weekends, we opted for free entertainment by watching old music videos online as well. Remember when MTV, which is supposed to be Music Television, actually played music videos all day all night? Remember when you actually wanted to say "I want my MTV?" What the hell happened to television? New York City is a big strain on your wallet. And that's a BIG understatement. High rent, occasional tendencies to jump in a cab to avoid cramped rush-hour subway rides, winter clothing, tipping the food delivery folks, and rows of restaurants on every street that you want to try. Then, you look at your checking account balance and get terrified. You have to balance the spending out somehow. 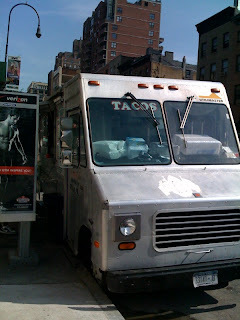 So today we had lunch on a budget at El Ídolo’s taco truck in Chelsea, at 14th St. and 8th Ave.
We hoped this taco truck was gonna be better then the hot mess that was the Endless Summer taco truck (aka Endless Bummer). And we were right. This is what El Ídolo offers. 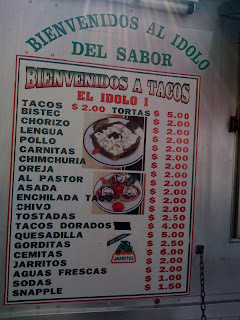 Good prices and a traditional Mexican meal. 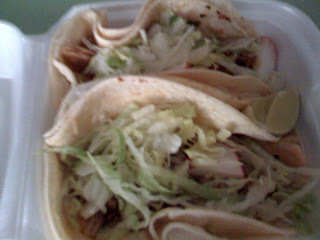 El Ídolo's chicken tacos. A good amount of chicken. Nicely, yet gently, flavored. 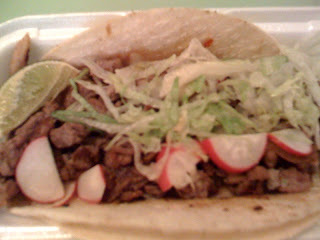 Traditional with two corn tortillas filled with meat, cabbage, radish slices and served with a lime on the side. Can't go wrong for $2. Pile on their red hot sauce for more flavor. You have to be very brave to eat it with the scary green sauce. I like spicy food and sauces but this one made my stomach do a cartwheel. I even saw this young Mexican kid in front of me exchange the green for the mild red sauce. Beware of the GREEN sauce. 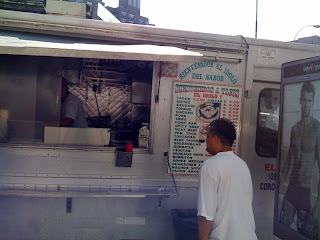 El Ídolos's $2 beef taco. Basic but it hits the spot. We will be making frequent trips to El Ídolo. We can't complain about $4 per person for a decent meal. We hope the truck doesn't drive away and park too far from us. How much is that black coat in the window? 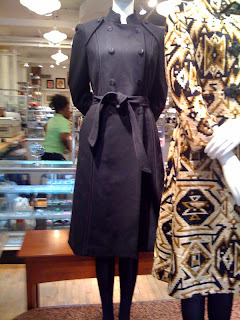 I had my eye on this Phillip Lim black coat for over two weeks, on display at the Angel Street Thrift Shop in Chelsea. The store had some fall merchandise, like this coat, only on preview until they went on sale today. The workers weren't allowed to tell you how much the coat cost, what size it was, wouldn't let you take it off the mannequin, nothing. Apparently, many people were asking about the coat so the friendly workers advised me, "On Sept. 13, come at 8 am, knock on the door and ask for Patrick, he'll give you a number, go get some breakfast, then come back at 10 am when the store opens. It's first come first serve." Every time I walked past this store window the last couple weeks, I felt like the untouchable coat was taunting me. So 7:30 am rolled around this morning and I could not peel myself out of bed. I thought, "I'll go at 10 when the store opens, if it's there, it's meant to be, if it's not, oh well, I'll get over it." When we got there, there was a small line to get into the store. A man behind us in line who had also been waiting to buy a coat said, "We're all here waiting for things we don't need but have to have." Sir, I just moved from tropical climate so I NEED and HAVE to have it. 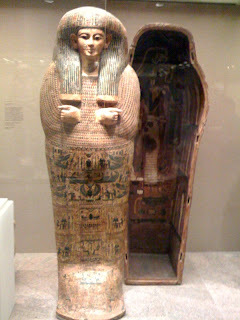 The door opened, people zoomed in trying to find what they had been waiting for. This lady went crazy when she got her hands on a cream-colored coat that apparently fit, screaming like an insane person with bug eyes, "it's mine!" Then we saw my Lim coat, grabbed it promptly, looked at the price (which was much lower than I expected it to be), and when I saw the size "6" on the tag, I knew it would fit and it did! The workers were funny, "Oooh, the coat, you got it." Oh yes, it was meant to be! 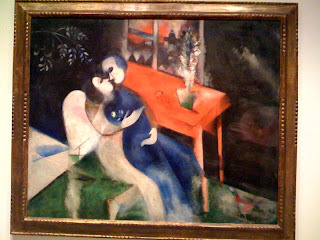 New York - the place of food, Broadway, shopping, music, and ART. 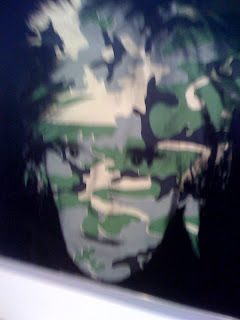 Incredible Art! We intend to see as much art, from the off-the-beaten-path ones to great classic originals that you never thought you'd see in real life. 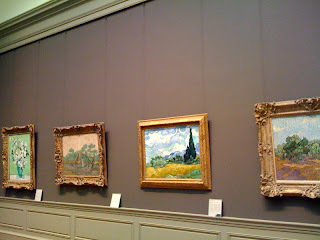 We got that chance the other day when we spent a day at The Metropolitan Museum of Art. Just $20 gives you an all day pass to see the kind of stuff that'll make your knees weak from excitement. 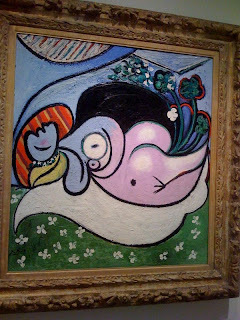 After having art history classes every day at Musee du Louvre, you think you'd be too spoiled to appreciate art at other museums. Not! 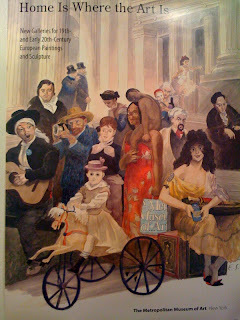 You will enjoy and appreciate and be delighted by every piece of art work here. 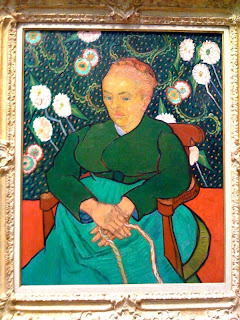 Wow, to see the sketch of Matisse's "The Young Sailor" next to the painting or to see a Van Gogh self-portrait. 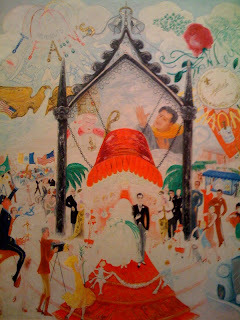 And since we're in New York, this piece below is titled "The Cathedrals of Fifth Avenue" (1931) by American artist Florine Stettheimer: "Turning her gaze to Fifth Avenue - New York's shopping mecca - Stettheimer treated the spectacles of high society and consumerism with affectionate humor. A newly wedded couple emerges from a church, ready to begin a life of excess and acquisition. Floating about them are the names of New York's most exclusive shops and food establishments." 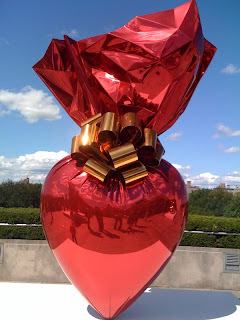 The Roof Garden at the Met (with beautiful views of Central Park and the Manhattan skyline) currently has the work of contemporary American artist Jeff Koons on display (through Oct. 26). 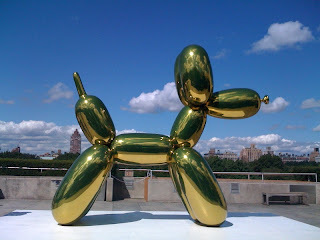 All of these pop sculptures are made of high chromium stainless steel with transparent color coating and took between six and eight years for each sculpture to complete. This is called "Coloring Book" and is inspired by the beloved Piglet from a Winnie the Pooh coloring book. 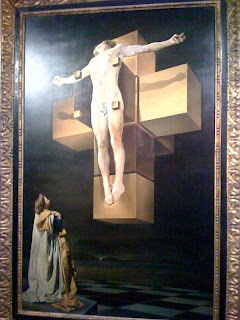 This "Sacred Heart" depicts the Roman Catholic image of the Sacred Heart of Jesus. We will see you again, and again. We love this poster! 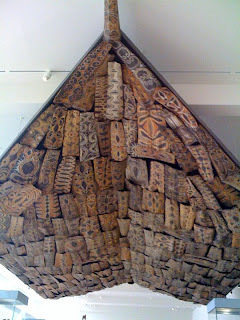 And it's on our living room wall.